What is Oracle Insight Methodology? Before getting into it, you should know that Oracle Insight was created to be a global business strategy development practice to leverage skilled industry experts within Oracle in standards such as Supply Chain Operations Reference (SCOR) for supply chains and Information Technology Infrastructure Library (ITIL) for datacenters, and a proven methodology for identifying and answering IT strategy questions. An Oracle Insight engagement can take from 3 to 6 months and follows a 4-step methodology that is customized for each individual client. 1. Industry perspective. Oracle Insight facilitates discussions with customer executives about the trends, best practices, challenges, and opportunities particular to the customer’s business. 2. Discovery. The Oracle Insightteam visits the customer site to study capabilities—in personnel, processes, and technology—that can be leveraged in an improved strategy. The team uses proprietary Oracle intellectual property and industry-specific frameworks in its assessments. Continue reading What is Oracle Insight methodology? 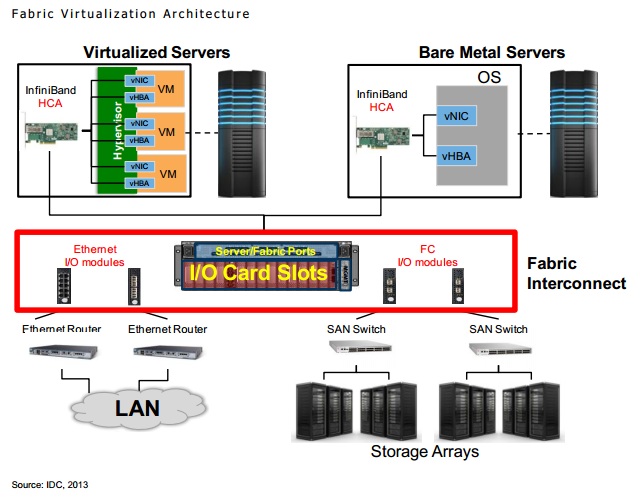 Fabric virtualization is a technology that significantly re-architects datacenter I/O by using a centralized device, often called an I/O director/gateway or a fabric interconnect. The fabric interconnect contains the physical I/O adapters, such as Ethernet or Fibre Channel, for multiple servers. The physical servers themselves connect to the fabric interconnect through an intermediate high-speed network and present virtual adapters to the attached VMs or bare metal operating system. Management software is used to provision, monitor, and adjust the I/O dynamically. The Oracle Virtual Networking product line, which is based on technology that Oracle acquired in its purchase of Xsigo Systems circa 2014, consists of a hardware fabric interconnect as well as several supporting software components. Oracle Fabric Interconnect (PDF datasheet) is the physical hardware device that virtualizes the I/O and fabric. It connects servers to Ethernet networks and storage (FC, iSCSI, NAS) through high-speed, low-latency InfiniBand that runs at 40Gbps per line, with 80Gbps for dual redundant lines. Dynamic virtual NICs and HBAs allow the connected servers to dynamically add or move connectivity, such as with a newly provisioned VM or a live migrated VM. Oracle Fabric Interconnect also includes QoS controls to manage SLAs. Get the Fabric Virtualization – Oracle Virtual Networking IDC White paper. Datacenter consolidation produces efficient, powerful, flexible, and cost-effective computing environments for enterprises in every industry, while delivering the highest quality of service for mission-critical applications. But the process of datacenter consolidation can seem an overwhelming, time-consuming, and costly undertaking. The new Oracle Exalogic Elastic Cloud is the industry’s first integrated cloud computing platform that combines hardware and software engineered by Oracle to work together for maximum performance and reliability. This offers customers a single enterprise cloud IT foundation and a scalable, fault-tolerant, and secure platform for datacenter consolidation. Today, enterprise IT staff must provide next-generation cloud features while meeting ever-more-demanding performance and reliability requirements. Oracle Exalogic Elastic Cloud meets this challenge. The solution creates a network and virtualized computing environment to run all enterprise applications, featuring integrated and balanced storage and an optimized Java infrastructure designed for middle-tier applications such as Oracle WebLogic Server, Oracle SOA Suite, and Oracle WebCenter Suite.